It that time of the month again, when I review the most recent Glossybox UK beauty subscription box. These are such treats for me every month when they arrive at my door. This month’s has a Hello Summer theme, so is full of colourful and hot weather-practical products. 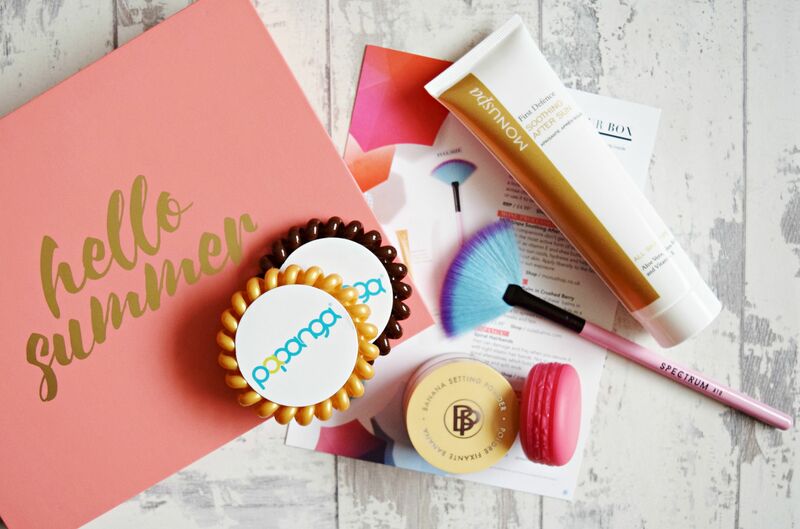 The July 2017 Glossybox UK beauty box* (normally £10 & P+P from Glossybox – but there’s a code at the end of this post to get it for just £5!) contains an impressive 4 full-size products, worth over £40, as well as a generous travel-sized item. The star product in the box is a stunning unicorn-coloured fan makeup brush from Spectrum. 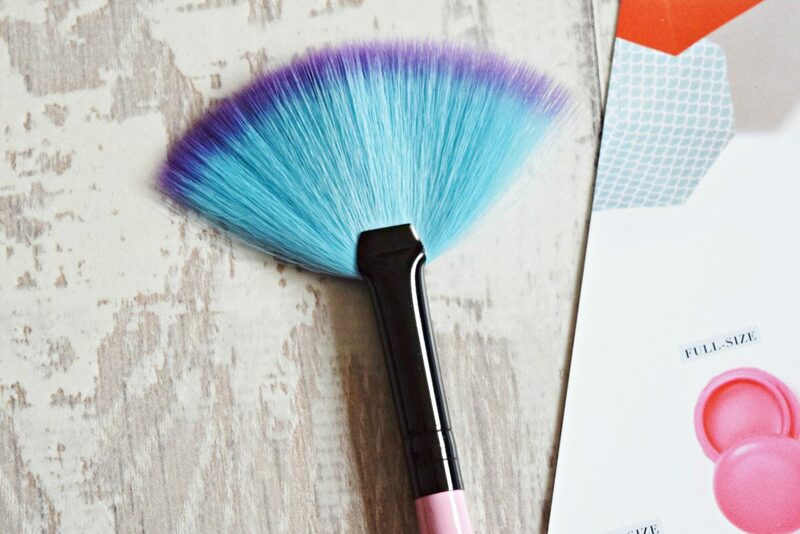 Their Small Fan A10 brush (worth £4.99) has soft, cruelty-free synthetic bristles. Use it to lightly dust highlighters over your cheekbones and the other high points of your face. Another aesthetically pleasing product in the box is a cute berry lip balm shaped like a macaron. 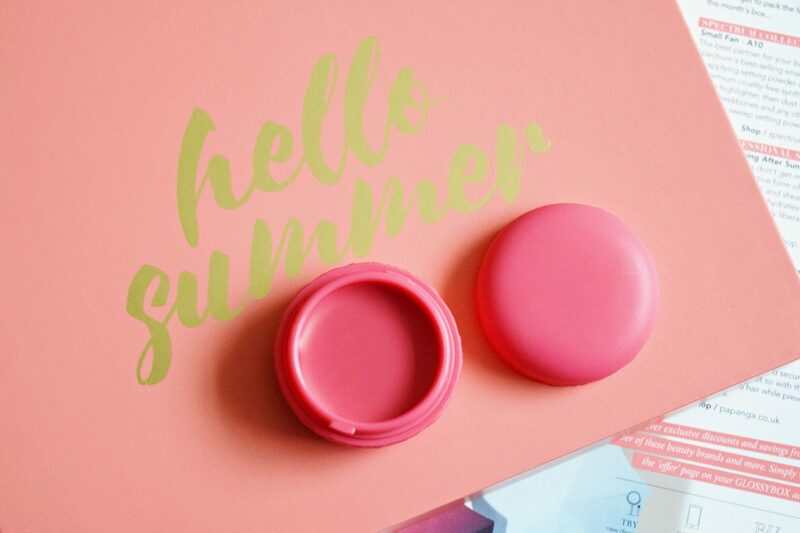 The Cutebalms Macaron Tint Balm in Crushed Berry (worth £5.99) is super handbag-friendly. It’s non-greasy, moisturising and has a sheer berry-toned finish. 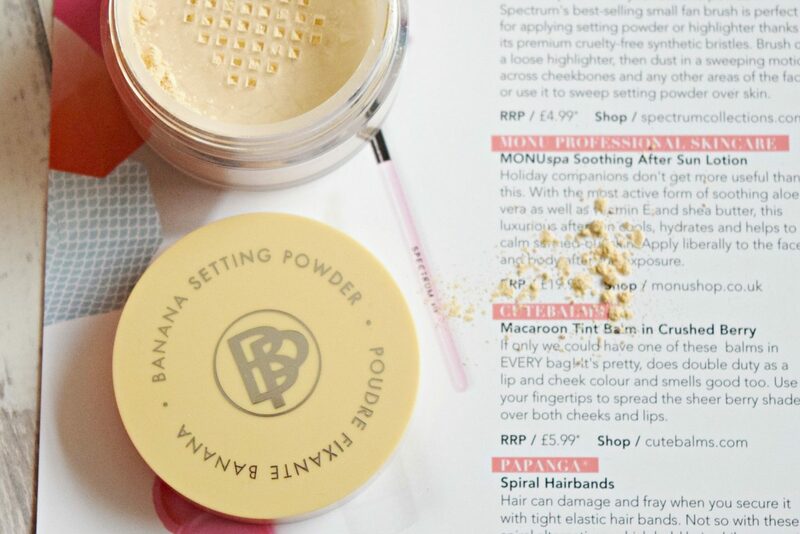 The most expensive item in the box is the full-size Bellapierre Cosmetics Banana Setting Powder (worth £25). This finely-milled loose powder is yellow-toned to counteract dark circles and other skin discolourations. I’m not a fan ok ‘baking’ my makeup, but if you are into this or want to try it (via a YouTube tutorial), this is a great powder to do it with. You can of course just lightly dust it over your undereyes too, to set your base underneath. You also get 2 Papanga Spiral Hairbands (worth £4.99) in this month’s box too. If you are already familiar with the popular Invisibobbles, these are basically just thicker and less stretchy versions of these. I actually prefer the Papanga bands as you can get a better grip with them without having to loop them round your hair 5 times. The idea behind these plastic bobbles is that you can tie your hair back – even when wet – and not be left with kinks in your hair when you let it down again (something you get with regular hair bobbles). Finally, you get a decent-sized sample tube of the MONUspa Soothing After Sun Lotion (full size worth £19.95). It’s a lovely, hydrating skin moisturiser that will soothe burnt skin, or just skin that’s feeling a bit dry after being in the sun all day. It contains aloe vera, Vitamin E and shea butter to nourish and condition. I really like it as it leaves your skin feeling very soft, with no grease. If you like the look of this box and want to snap one up, you can subscribe here – you can get 50% off until 31st July 2017, if you enter the code SUMMER – that’s an amazing bargain! Next month’s box is a kind of sister to this – it has a Girls Just Wanna Have Sun theme, and you should be very excited!